Poor Croc, back in 1997 things must have seemed so rosy for the cute little critter. While platform game fans were fawning over Super Mario 64 on the Nintendo 64, Croc came along to Playstation, Saturn and PC owners to give them their own cutesy 3D platformer. While Croc was never going to usurp the famous plumber on his first 3D outing, it didn’t matter to the many users who had no access to Nintendo’s hardware. Croc was a huge success, shifting over four million copies worldwide. A successful sequel also appeared a few years later, but after that no trace of the cute crocodile was ever seen again. Fortunately, you can bring Croc out of retirement any time you like by playing the original game on your PC. Croc might not look so spectacular by today’s standards and the dated camera controls can feel quite awkward, but there’s still plenty of fun gameplay in here, more than enough to entertain younger players on a rainy afternoon, for instance. Croc should install on any PC with the minimum of fuss, simply place the CD into your computers optical media drive and follow the on-screen prompts. If the autorun menu does not appear automatically, browse to the CD in Computer/This PC and run the Autorun.exe file manually. When asked what type of installation you want to do, choose “Full”. If the installer offers to install DirectX for you, choose “No”, since the version included with the game is certainly older than the version you will already have on your PC. If you see the option “D3D Hardware Acceleration”, then you have the second edition of the game and you can proceed to the next part of this guide. If you don’t see that option, you have the first edition and will need to download the patch. To our knowledge there was never an official patch for Croc to enable Direct3D compatibility on the older versions of the game. If you have the older version of Croc, you can download our unofficial Croc patch here (link broken? let me know here). The patch is very simple and just replaces a couple of files that were changed on the later edition of the game. Simply run it after installing Croc and you will then be able to enjoy the DirectX version of the game. 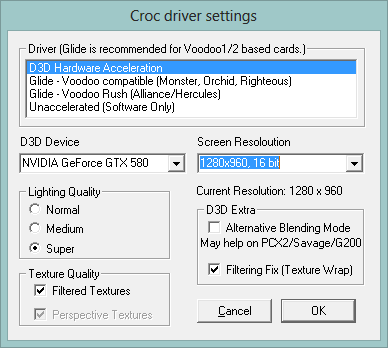 Visual settings for Croc can be configured from the games launcher by selecting “Change driver settings”. In the screenshot above, you can see the visual settings for the game. On modern PC’s, you should select “D3D Hardware Acceleration”, change lighting quality to “Super” and enable Filtered Textures. Turning on “Filtering Fix” is also recommended. When choosing a screen resolution, remember that Croc is a 4:3 (non-widescreen) game. The launcher will let you choose widescreen resolutions, but the games graphics will be stretched if you use one. To avoid this, choose a high resolution 4:3 screen-mode instead, such as 1280×960 or 1024×768. Click on “OK” when you are done changing options. You can now click on “Play Croc!”. The game will then start. Watch the little intro movies or simply press Escape to skip them. Before you start the game, there are a couple of other options to tweak. From the games main menu, choose “Options”. The first menu you will want to visit is the “Audio Setup” menu. From here, we recommend you turn “Ambient Sound” to “OFF”. The ambient sounds may simply be played incorrectly on more modern PC’s or perhaps they were always like this. Regardless, unless you want strange twangs and low pitched out of tune synthesizer sounds playing while you enjoy your game, turn these ambient sounds off. On the Display Setup menu you can change the screen resolution and also turn the graphics quality settings up higher or lower. These are the same options you set in the launcher, but being able to tweak them here you can instantly see the difference they make to the games visuals. Finally, before you start you may wish to customise your controls. Croc fully supports modern controllers and we had no problems mapping our X-Box 360 controller to the appropriate actions in-game, no Xpadder needed this time. With those settings all configured, you are now ready to start your adventure. Croc will run perfectly for the most part, however there are one or two issues you may encounter. Administrator rights are needed when Croc is started – By default, the game will start by loading the CrocRun.exe program. This program will ask for admin rights each time it is run. If you are installing the game for a child, for instance, you may want to avoid this. To run Croc without the UAC pop-up, configure the game initially using the launcher and then use the “CrocD3D.exe” to start the game in future. You can create a short-cut to CrocD3D for your standard user and delete the shortcut that points to CrocRun. Keep in mind that, like many old games, Croc needs to write to its installation directory in order to save games, so you may need to reconfigure file permissions on the Croc folder so that your non-admin user can save his or her games. If you are not sure how configure folder permissions, see this tutorial. Be sure to test that this works before embarking on an extended play session, as the game itself won’t warn you that it couldn’t save, your save will simply have disappeared the next time you come to play. You should also read the section “Settings don’t apply properly when the game is not run as administrator” and “Directdraw/Direct3D crashes”. Ambient sound plays incorrectly – We’re not 100% sure on this one, but the ambient sound seems to simply be a series of annoying twangs. Turn them off in the options menu. CD audio / no music problems – The Croc CD-ROM must be placed in the CD/DVD drive on your machine that has the first drive letter. If you have more than one (this includes any virtual CD/DVD drives you might have as part of a CD/DVD recording suite), make sure to use the drive that comes first alphabetically. If you need to change the drive letters of your optical drives, see this tutorial. If you’re feeling adventurous you can try this patch, which supposedly fixes the music in game, allows it to loop properly and includes missing music from the Playstation 1 version. However, we tested it here on our Windows 8 machine and it didn’t work. Music played initially but as soon as the track was supposed to change, the music stopped and simply never returned. Crashes when using the game launcher – If the game launcher crashes while you are trying to reconfigure the graphics settings, add the “CrocRun.exe” program from the games installation directory to your list of programs excluded from DEP protection. For details of how to do this, see this tutorial. If you still have problems, make sure to run the launcher from an account that has administrator privileges (not just by using UAC to launch it on a standard account). Crashes after the opening movie (where the little Gobbo creatures blow up the balloon) – If the game crashes at this point, you have the wrong audio CD in your CD/DVD-ROM drive. Make sure the Croc CD is in the CD drive with the first drive letter (e.g if you have a CD drive E: and a CD drive F:, the Croc CD must be in drive E:). Directdraw/Direct3D crashes – If you get an error window when you start the game, containing some information about being unable to find or lock a surface, check that you have configured the game to use Direct3D rather than any other rendering mode. If you have configured this, follow the steps under “Settings don’t apply properly when the game is not run as administrator” to clear the VirtualStore keys in the registry. Gamepad is not detected – Happens on some machines if the game is run as administrator. Run the game without admin rights instead, see “Administrator rights are needed when Croc is started”. No sound on the intro movie – For some reason there doesn’t seem to be any sound playing during the intro movie (the one selectable from the main menu), we’re not sure if this is a fault on modern machines or if it has always been like this on the PC version. Right click on the Croc key in the left hand side of the Regedit window and choose “Delete”. This will force Windows to take a fresh copy of the games settings into the VirtualStore the next time the game is run, updating any settings that may not have been correctly copied the first time. If you need a beginners tutorial for Regedit, click here. Sound volume sliders do not work – Although the game has options for Music and Sound FX volume, the options don’t seem to do anything and always reset themselves when reconfigured. Music and Sound FX still play correctly in game. Tracks do not loop – The audio tracks on the CD do not seem to loop, even if this option is selected in the games audio settings. First of all, thumbs up for the tutorial! this game’s graphics crashes after i get on the main menu. any help? This is happening to me as well. Windows 7 64 Bit machine. Before patching and changing video settings, the game crashes after video intro. With the Direct X patch, I can now enter and play the game but the graphics work on only the top 15% of the screen. The rest is black or another solid color. Completely unplayable at the moment as a few movements in game cause the graphics to crash completely. Any ideas out there on a fix? Have you made sure you have the very latest Direct X end user runtimes? The ambient sounds used to be bird tweets etc. They are stored as MIDI/SF2 pairs. Newer PCs seem to be unable to play these SF2 files (these contain the actual sounds) and only play the MIDIs which will result in strange synthesizer sounds. Hello, I need help to install Croc in Windows 7 64 bits, can anybody help me please? Thanks for reading! It should install just fine, what problems are you having? Following this tutorial, Croc runs when I don’t have the CD in. However, I want the CD in so the background music will play, but when I try starting Croc with the CD, it crashes upon reaching the main menu and throws up an error about crocd3d.exe crashing. Do you have any suggestions? The music won’t run from a Daemon Tools mounted iso, either. Nice find! I’ll give this a go myself and update the tutorial when I get chance. Well, just tried it, doesn’t work, at least not on Windows 8. The music starts playing, then when you move from one area to the next it stops and never starts again, even if you exit back to the title screen. I just tried it; it mostly works on Windows 7. The only thing that has failed so far was the intro movie, which has no sound. Thanks! I haven’t gotten to test it much yet, but this makes the music work! The intro movie still has no sound, but that’s a minor detail. I’m on Windows 7, by the way. Hey, me again. I just found a pretty annoying bug with the Croc installation on Windows 7. It turns out that the game prohibits save game overwriting, which makes it more difficult to stay updated on progress. 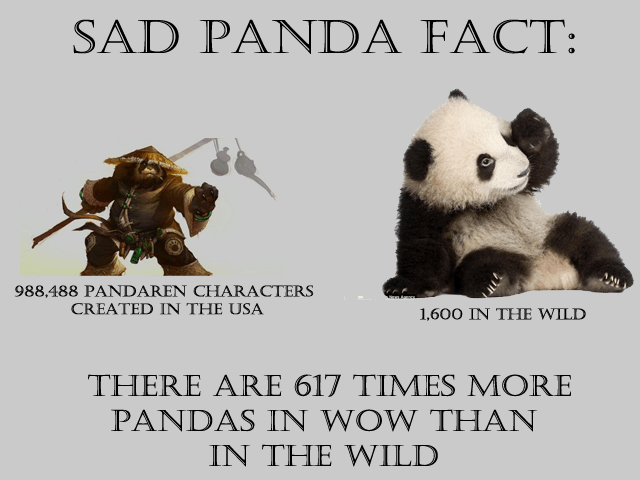 This effectively limits us to a finite number of saves. Does anyone know of a fix for that? You should say that on Windows 8 and 8.1 ppl must choose compatibility with Windows XP SP2 on the 3 executables (CrocD3D, croc and CrocRun) otherwise the configuration tool crash (CrockRun isn’t needed but just in case). I suppose that this must be apply on Win7 too but I didn’t try. my game is in the correct drive, however it still stops working after the opening movie. I am running windows 8.1. Really want to play but it is not working. Any help would be greatly appreciated! You could try making an image of your CD and running it in a CD/DVD emulator as per this tutorial – http://www.top-windows-tutorials.com/alcohol-tutorial-images/ Make sure your virtual DVD drive is using the first drive letter as per the instruction above. I did everything from the tutorial, but the game’s graphics makes it inpssible to play. I can see the manu, but animations leave black stripes acros the screen. And when I started a game I couldn’t see anything. Tried esc and laptop froze. I have win7 x64, and geforce 755M, though croc doesn’t seem to detect it. Works fine here on a GTX 770. Have you installed the latest DirectX end-user runtimes? I installed the patch from the tutorial and changed settings as showed. Nothing else. What is a DirectX end-user runtime? Thanks for the link. I tried but at the end of instalation process I got a system error. I looked into logs, but have no idea what happend. I managed to install DirectX, but the graphic problem still remains.Anything else I can do? Play with the options under “D3D Extra” on the “Croc driver settings”. Sorry for doubling the message but the one I just posted made itself as a new comment, not reply. I tried but it doesn’t make much of a difference. Only that if I have both checked/unchecked it’s even worse. Tere is also one thing that concerns me. At the 3D3 Device field I can’t pick my geforce because it’s not there. I have only Intel’s graphics or ‘main screen driver’. Maybe that’s the reason of my problem. Do you see a difference when you switch graphic to integrated in croc? I’ve not tried the game on a laptop, only my desktop. Seems odd that it wouldn’t work with similar hardware just because it was an integrated chipset though. Yes I suppose so. I’ll try installing croc again, maybe it somehow didn’t notice the update of directx, and if that doesn’t help the only other way I can think of is installing a virtual machine. I’ll write if I solve this, maybe someone will find it helpful. Thanks for all youl help. I recently dug up my copy of this game and installed it. I used your patch to get DirectX working (thanks!). However, I seem to be having this weird issue where the game is killing my computers audio completely—including once I exit the game. Restarting my computer after doesn’t bring my audio back. 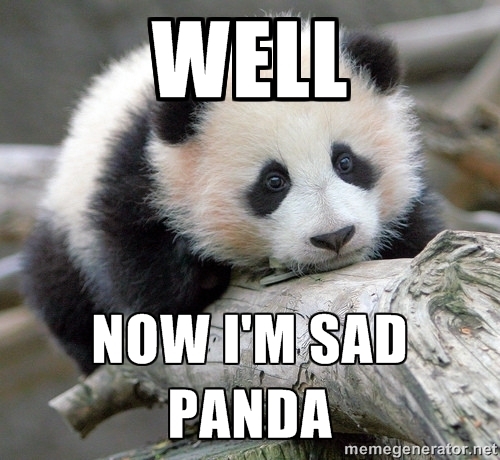 I have to actually reinstall my audio drivers to get it working again. It’s happened to me twice now. The first time was without the CD in the drive (I think, since I didn’t have any menu music), and I had just finished messing around with the in-game audio options (which seem to be useless anyway), and then when I selected “start game”, all audio cut out. The second time, I had the CD in to have access to the music, and the audio died as soon as the first demo played after leaving the game on the title screen. Anyone have any ideas on why this is happening? I’m running Windows 8.1, and my audio driver is IDT High Definition Audio CODEC version 6.10.6491.0. I don’t think running Croc could do that, it’s certainly nothing close to what I’ve ever seen. Are you sure it’s not just muting the audio somehow? There may be a more fundamental problem with your PC. Did you make sure you have the very latest audio drivers installed? It’s definitely killing audio completely. I’ve tried muting and unmuting and it doesn’t fix it, nor does rebooting the computer. Device manager says that the latest driver is installed. It’s really weird, because this has never happened to me before. The only other time I’ve completely lost audio was after an improper installation of a new driver. Also, this problem happens only after a screen transistion: the first one when transistioning to the “start game” screen, the second when transitioning to the demo movie. I’ll mess around a little more later today and see if I can reproduce the problem, and I’ll report back if anything else happens. So I can consistently reproduce the issue of sound loss when I have the disk in and it transitions to the demo movie screen. I’m afraid there is something wrong with my sound card, since today I also installed Halo: Combat Evolved and had the same sound problem when I first launched the game. It’s never happened to me before with newer games or patched old games that were purchased from sites GOG or Steam. I’m not quite sure what the problem is or how to fix it. If you have any ideas, help would be appreciated! If not, thanks anyway. Definitely check the manufacturers website for an updated driver. I did everything from the tutorial but graphics makes playing inpossible. I have win7 x64 ang geforce 755M, though croc doesn’t seem to detect it. Croc runs perfectly, but there is no music (though I don’t remember ever having it in Croc) and the videos don’t work :< they are just skipped. Can anyone help? Great tutorial, but I just came to ask: Anyone tried with a Dualshock 4 controller? I have a 64 bit Win 7 laptop, I have everything in theory that is needed to play the game. But I can’t even install it! I can mount the ISO file, but when I try to Install the game (either by using Autorun or Setup.exe), my laptop doesn’t do ANYTHING! I’m just waiting and waiting, but nothing happens. :/ But my sister was able to intall the same ISO to her 64 bit Win 8 laptop… What can be the problem? Try temporarily disabling your antivirus or other security software while you install the game. By now I am sure that this is an older post, but never the less need help and haven’t found a better place than here to get Croc: Legend of the Gobbos working- better. As i enter the main menu, anything that is in motion leaves a trail of black or empty partials. Leaving a permanate mark as the game continues. Using windows 7 I easily installed Croc using an iso from googling and then used the music patch mentioned in this article to re-enable the music. Woop, the problem with that patch is that it has the music from the PlayStation version, not the PC version. I haven’t been able to find a way to enable the PC version’s music on Windows 7. Music plays just fine for me but doesn’t loop. Couldn’t get that patch to work at all. Much as I hate to say it, it seems the best way to play Croc is to make a small Windows XP partition for it. The only way I could play the game is to set the driver settings to “Unaccelerated (Software Only)”. This way I don’t have a glitched screen like many other people mentioned it. But then there is another problem: I can’t control anything. both Voodoo’s are working with the nGlide installed. Thanks! This worked like a charm! Never encountered that, try disconnecting all your game controllers. After disabling the the bluetooth controllers (mine were Nintendo Wii U Pro Controller and a WiiMote) at the Device management, I was able to use the game properly. I’m trying to run the installer from the ISO I found and nothing pops up, no install screen no nothing. All I can do is let the Autorun-Promt run and say “Install Croc” but nothing else happens except the Setup.exe asking me to give it admin rights (which I did). I tried various compatibility modes and so on, nothing helps tho. I’m on Windows 10 64bit. Could also be something else interfering with it on your PC. Try performing a clean boot and then running the installer. I followed the guide and have gotten everything to work except the end level music after hitting a gong. All the other music plays just fine. I’m using an original release disc (so had to use the Direct X patch) on a Windows 7 machine. Any ideas? You know the croc driver settings? well it doesn’t open, it just crashes. Nvm, I installed dgVoodoo and it fixed the issues. I simply could not get croc to run on PC off the bat, no matter what I did. Instead (forgive me) I had to download an ePSXe emulator and download the croc game for ps1 and run it like that. I don’t care about how it looks on ps1 as long as it works. Shouldn’t look bad if you configure your emulator correctly. I believe he meant the lack of floating point numbers on PlayStation, resulting in those jittery 3D graphics. That’s why I didn’t want to settle for the PSX version. Great tutorial, by the way! Well, I have a strange issue. Croc was working fine a few months ago but now it freezes after the intro videos. It seems that this happened after updating my nVidia drivers (I have a Geforce GTS 450). No matter what compatibility settings and resolutions I tried, it keeps freezing. Any ideas how to fix this? No, I didn’t try it. Thanks, I’ll try it and I’ll keep you updated! Just in case there’s anyone with the problem of not being able to start Croc due to the “Error initialising platform” error: I figured out what causes this error. It’s the missing “Saved Games” folder in your Windows library. The Saved Games folder has to be on the same hard drive/partition as your Windows installation, so you can’t change this folders path. It most likely has to be at C:\Users\*Your Name*\Saved Games. If the folder is there, the game is going to launch.